We are located at 2633 Regent Street by Derby Street on the south side of campus. We are just 6 blocks (4 short ones) from campus (Bancroft and Telegraph main college entrance) just 10 minutes away on the South Side of campus. We are four houses from wonderful Willard Park with great grass fields to enjoy. We are just a few blocks from Cal Dining. We are close to many great restaurants on Telegraph and College Ave.
We are close to the fancy area on College Ave (you'll love it, best ice cream shop around!). 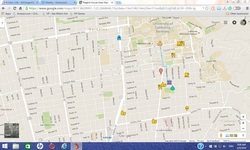 CLICK on the MAP below for an interactive map to find cool places and Grocery Stores Close by!